Some say that Billie Holiday is the greatest jazz singer ever. Her crystalline vocal clarity sounds like a bell, and the way she bent, swooped on and swerved around notes was from the heart of the blues. She could be girlish and youthful, but even as a teenager, she intoned a gravelly quality of maturity. Especially during her early period, Holiday wasn’t maudlin. She paired optimism and realism in a way that still speaks volumes today. April 7 marked the centennial of Holiday’s birth, and numerous tributes, recordings and books have been released in her honor. Jazz at Lincoln Center held a festival with talk and concerts by the incredible young songstress Cécile McLorin Salvant, elder stylist Andy Bey and others. On April 6, Holiday was inducted into the Apollo Walk of Fame in a Harlem ceremony that included songstress Cassandra Wilson, who released a spell-inducing tribute CD, Coming Forth by Day, on Holiday’s birthday and lit up the Apollo stage in her honor Friday. Why is Billie Holiday relevant today? In theater productions, Dee Dee Bridgewater and Audra McDonald have both played the part of Lady Day, the nickname Lester Young—one of Holiday’s key bandstand partners—gave her back in the day. Scholars Robert O’Meally, Farah Jasmine Griffin and Angela Davis have plumbed the life and artistry of Holiday, as has cultural historian John Szwed in his recent book, Billie Holiday: The Musician and the Myth. Maya Angelou and Albert Murray provide clues to unlocking the mystery of Holiday’s hold on our ears and imaginations. 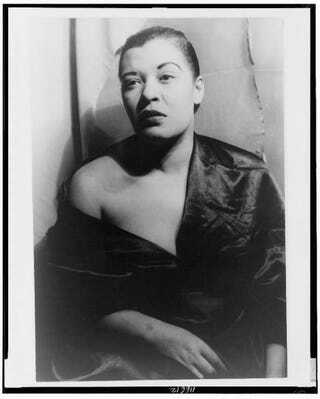 Angelou once wrote, “Billie Holiday was a keen observer. She saw through lyrics and she saw through people. And she chose what and who she wanted. She sang every song not only as if she had written it herself, but as if she had written it that very morning.” Holiday’s interpretive style drips with artistry and female agency. Murray, in his expository classic Stomping the Blues, centered on how Holiday’s extension of the grand tradition of jazz is more crucial than the tragedy of her life. “The great and lasting distinction of Billie Holiday is not based on her highly publicized addiction to narcotics (a showbiz, rather than a blues-idiom, phenomenon) but on her deliberate use of her voice as an Armstrong-derived instrumental extension.” True that, as can be heard with modern fidelity on the Sony Legacy anthology Billie Holiday: The Centennial Collection. Holiday had a rigorous musical apprenticeship in Baltimore before being discovered by John Hammond, who paired the young Holiday with Benny Goodman in 1933 amid the Depression. Those recordings didn’t make a splash, but when Holiday was paired with pianist Teddy Wilson in 1935—and other jazz giants like Roy Eldridge, Ben Webster, Johnny Hodges and Lester Young—her star rose rapidly. The Centennial Collection captures Holiday from 1935 to 1945, during the early phases of a career that ended in the late 1950s. Many hear sadness in Holiday’s voice, and of course that’s there. Yet, as Griffin has said, Holiday could also be “funny, bubbly, or hip.” The collection includes her classic “God Bless the Child” and her most political rendition, “Strange Fruit,” about Southern lynching. On songs like “What a Little Moonlight Can Do” and “Them There Eyes,” you’ll hear playful mastery of time and tune, and sultry rhythm and groove. On the latter, she floats ahead and behind the beat, presaging later rap and spoken word, while embodying the flow and swing of jazz, articulating like a trumpet or sax player. As a young artist, her signature sound and approach were profoundly influenced by Louis Armstrong and Bessie Smith, but she developed a style that returned the favor for generations of musicians after her. She influenced a plethora of singers, from Sarah Vaughan and Carmen McRae, Abbey Lincoln and Nina Simone, to Erykah Badu and Frank Sinatra. Some of these artists had vocal abilities that far exceeded Holiday’s. Even though her vocal range was relatively small, Holiday—true to African-American culture—mastered making the most of what she had to work with. As a great artist, Holiday covers a range of emotional registers. But the stereotype of Holiday as a troubled, tragic woman, rebuked and scorned by wicked men; as a self-destructive, addictive personality, is so prevalent that this centennial recording, displaying her early years of musical triumph, serves as a welcome antidote. It’s been 100 years since her birth, but Holiday’s legacy continues to play on.